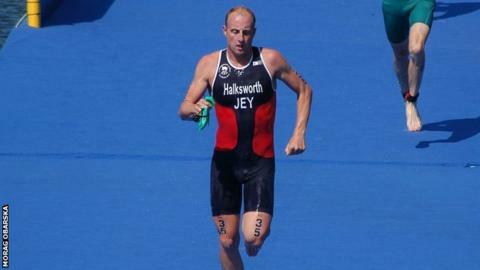 Jersey triathlete Dan Halksworth says he is capable of making the podium at the World Ironman Championships. The 28-year-old former British champion was forced to pull out of this year's event in Hawaii after becoming ill during the marathon section. But he says he is capable of returning fitter and stronger. "Within the next three or four years I want to be top five and the aim after that is to make the podium," Halksworth told BBC Radio Jersey. "I don't see why I can't, I've got into Ironman at a young age and I want to go out there and beat everyone." Racing for his island in Glasgow meant he had to give up his British Ironman title which he won in 2013. "I'm still young in Ironman terms and I'll be back stronger and tougher next year." The World Ironman Championships in Kona are seen as one of the toughest tests of endurance anywhere in the word. Athletes begin with a 2.4-mile swim, then have a 112-mile cycle race before ending with a marathon. Halksworth was eighth at the end of the swim and 14th after the bike ride before illness struck eight miles into the marathon. "I started being sick and had to keep stopping to be sick," he said. "I was seeing people who were asking if i was OK as I was wobbling around the course. "At one point I stopped and fell backwards and someone caught me." Halksworth needed two intravenous drips to help him recover as temperatures hovered around 40 degrees Celsius at times. "If I had carried on at the pace I was running at before I had to stop, I don't think top 10 was out of my grasp," he added. "A couple of hours after the race I was fine. "I was in the mix and that's all I could have wished for.